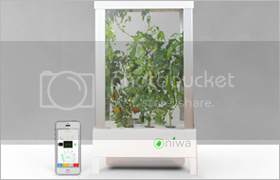 Last month the Niwa, a fully connected growing system that enables you to grow your own fruit, vegtables, flowers, and even herbs was successfully funded via Kickstarter. It’s a fully automated hydroponic system that attends to all of your plants’ needs so you don’t have to. The system is designed to water them, feed them and make sure they have optimal growing conditions. Hydroponics is an efficient method of growing plants using nutrient solutions, in water, without soil. The brain inside the Niwa is an ARM M3 microcontroller loaded with custom made software which constantly gathers data from the multiple sensors like: temperature, humidity, light and water level. With this data it can automatically control the lamp, heater system, fan and water pump to make sure what you are growing are in optimal conditions. If you’ve been looking for a hydroponic garden system for your home the Niwa looks like a great starting point. The Kickstarter is now over but you can still preorder off their website. If you love DIY projects you can even buy the kit in pieces so you can build it yourself which includes the plans, the equipment, electronics and sensors as well as the layouts to construct the body. Check out their promo video from the Kickstarter campaign.